Has Apple's time finally come? The announcement at Apple's big event that it is launching an iPhone that is NFC enabled and Apple Pay as its go-to-market payment service is a really interesting development. Whilst NFC technology has been a feature of many Android handsets for some time, it has struggled to make a real impact, so Apple's entry in to the market gives it a significant boost and begs the question: what does Apple Pay do that other NFC payments platforms don't? It's telling that during Tim Cook's Apple Pay speech, he made the claim that other NFC payment systems focus on the business model whilst Apple has focussed on the user experience. This is of course what Apple is brilliant at: energising markets and technologies that already exist by making them work in a way that consumers are happy to engage with. And mobile payments is no different: an already crowded market, with plenty of start-ups and established payment providers in the game, but Apple takes a different tack, which is the exact opposite of rivals Google and its Google Wallet. Apple has put a security chip into the device where Google has stopped doing so. Apple doesn't track the transactions of the user (shop, location, item etc.) which instead is Google's core business driver. Apple doesn't even insist on storing the user's credit card details, unlike Google Wallet. That's interesting because it means Apple is not trying to monetise transactional data in any way, although they will earn a hefty fee per transaction. Rather the main point of Apple Pay appears to be another way to tie consumers to the iPhone platform. And it's not trying to disrupt other parts of the payment business ecosystem, relying on support from banks and major credit card companies such as American Express, MasterCard and Visa from the outset. Superficially, there is little novelty. You walk into a shop and tap your device on the NFC terminal to pay for goods. But the similarities with Android end there. Apple has hundreds of millions credit cards already on file in iTunes, so you probably didn't need to enroll specially in the service. That's one up on many alternatives. And to make the purchase, you put your finger on the Touch ID fingerprint sensor, having read the details on your phone screen. This proves that it's you holding the phone, and that you were making the payment quite knowingly. That's a big deal, because it removes two of the big current NFC risks - risks that force transaction limits (£20 in the UK) which have restricted NFC use to buying sandwiches. It turns the iPhone 6 into something like a portable PIN pad. And it's a PIN pad which hides the credit card from the merchant, substituting it with a perishable token. As we'll see, this addresses a key consumer concern, especially in the days after the Target and Home Depot card break-ins. But are these enough to revolutionise the market for payments, as Apple claim? It is never, ever a good idea to underestimate Apple's ability to revolutionise a market, as history shows. In 2010, MEF was one of the very few commentators to endorse Apple's claim that the iPad would revolutionise content consumption. The challenge in this case is that, as MEF Special Advisor Roy Vella puts it, "payments are not broken". It's not at all clear what Apple Pay improves so dramatically that consumers will feel impelled to change their behaviour – at least in countries where Chip & Pin is already ubiquitous. 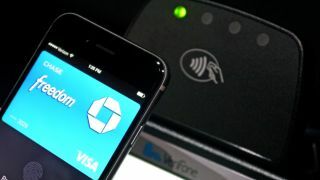 But in the United States, a major discontinuity is coming – the introduction of Chip & Pin over the next year. Consumers will have to learn a new payment behaviour anyway, and perhaps Apple is judging that its solution is a better way.